Whether it’s a clogged drain, a burst pipe or hot water system issues, no plumbing problem is easy to fix. Often, a homeowner can actually cause more problems by trying to fix a leak or unclog a blogged drain. We spoke with a plumber to find out what plumbers really want us to know. Some of the most common plumbing problems we come across have to do with homeowners pouring and dumping things down their kitchen sink shares Don. Cooking oil and grease should never be flushed down the drain, because they can congeal and cause blockages once they cool. A better solution is to pour used cooking oil or grease from fried foods into an empty soup can or milk carton and freeze, and then put it out with the kitchen trash on rubbish collection day. Think your rubbish disposal is tough enough to take on any food scraps you throw in? Think again. Homeowners should also avoid dumping food into the garbage disposal, says Don. Food such as celery, fruit and potato skins, for example, cannot be properly broken down. If you have food scraps to et rid of, try to dump them into the garbage bin as much as possible. One of the biggest mistake homeowners make is ignoring their plumbing fixtures says Don. A small problem such as a slow dripping faucet, when ignored, will eventually result in damage to the faucet itself, requiring an early faucet replacement instead of a relatively inexpensive seal repair. Who really pays attention to hot water systems? “These appliances are typically tucked away somewhere so homeowners easily forget to perform much-needed regular maintenance on them shares Don. To keep your hot water system operating right, don’t forget to flush the tank once a year. Also don’t forget to check the anode once a year for rust and oxidation. Hot water systems cost hundreds of dollars to replace, and taking these simple steps can really help lengthen the life of your system. Homeowners quite often attempt to make plumbing repairs themselves, however, many minor plumbing problems can turn into costly mistakes if not handled properly. Think twice before tackling a difficult plumbing problem your own. Many homeowners mistakenly pour strong chemicals into drains, thinking of it as a quick fix. These chemicals can eat away at some types of underground drainpipes shortening their life. Sometimes the quickest solution isn’t always the best solution for the life of your pipes. Think you can handle plumbing repairs on your own? 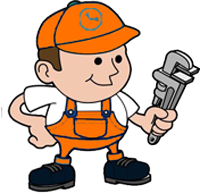 Plumbing repairs attempted by unqualified persons frequently lead to the realization that most amateurs do not have the special tools and experience necessary to do the job correctly. Attempting large plumbing repairs can lead to an unsafe system that does not comply with local plumbing codes and can result in a lot of damage to the system. Anytime you are unsure about how best to handle a plumbing situation, make sure you call a plumber. A very common plumbing emergency is flood damage caused by rubber washer hoses that have burst. Often, these emergencies could have been avoided by switching to stainless anti-burst lines. If your home is older, you should consider having a licensed plumber come out to inspect your water lines to see if you might need to upgrade. Do you know how to turn off the water if you need to? To avoid irreversible and expensive water damage to your home, know your plumbing system. Ensure all of your shut-off valves actually work, and know how to turn off the water during an emergency. If you have a plumbing issue that you aren’t sure how to deal with, the best thing to do is call a plumbing professional. While you may worry that a plumber will be expensive, in the long run a serious plumbing problem can cause a whole lot of trouble if not treated properly.